Chances are, you've probably heard some version of the Old Testament story of Moses and his quest to free the Hebrew Nation's thousands of slaves from the Egyptian Pharaoh Ramses. 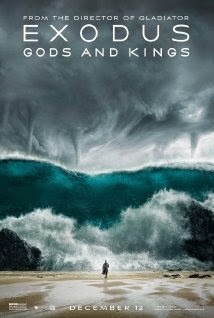 In this Ridley Scott film (Director of Gladiator and Prometheus), Exodus: Gods and Kings is an expansion of the original Bible story with visual effects galore. Even with the special effects, however, what hit home most for me was the plague. It was portrayed not as magic, but as an act of nature or God and very realistic and powerful. Christian Bale plays the iconic character of Moses. It was good seeing him without a deep voice and a bat suit and he did a good job. Joel Edgerton plays the pharoah Ramses, who doesn't really come off as the bad guy, which is what he's supposed to be. Other actors who I didn't notice from the trailers (Sigourney Weaver, Ben Kingsley) made appearances as well. Although Exodus was about two and a half hours long, it cycled through the story rather quick. I think it should have been longer and added scenes to get to know more of those other important characters. Unlike Noah, which was a flop and shouldn't be watched or spoken of again, Exodus hits the mark pretty well and is mostly true to the Bible. You know what you're getting going into when you go to see it and won't be surprised by anything else (which isn't necessarily a bad thing).